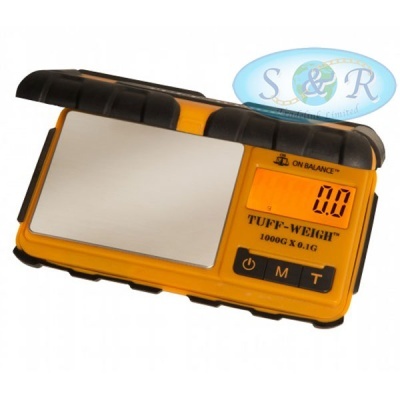 From On Balance this portable precision Tuff-Weigh digital scale is cut out for your toughest jobs! 1000 grams capacity, 0.1 gram resolution. Orange hard plastic case with rubber grips. Extra-large 14mm display digits against a bright orange backlight. 6 weighing modes include grams, ounces, troy ounces, pennyweights, carats and grains. 76 x 59mm stainless steel tray. Selectable auto-off allows you to change the auto-off time to suit your needs. Detachable lid doubles as a tray. Tuff-Weigh, where precision and strength collide!